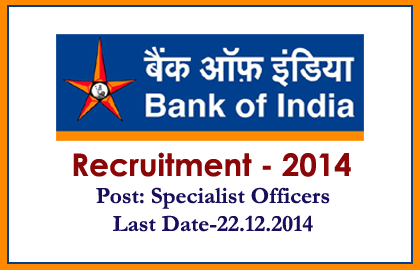 Bank of India has announced opening for the post of Specialist Officer (Grade- I,II,III,IV,V). Eligible candidates can apply for this post on or before 22.12.2014. More details regarding this recruitment were given below. Candidates will be selected on the basis of the performance in the Online Examination and Interview. Eligible candidates can apply through online for this post from the bankers website:www.bankofindia.co.inor go to applying page directly by clicking the link given below. Candidates can pay the application fees through online only.